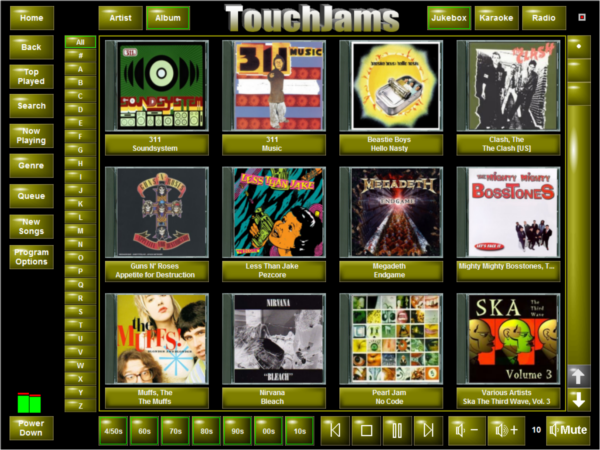 TouchJams allows you to easily turn your Windows PC into a digital jukebox using your already existing music collection. Although TouchJams was designed specifically for use with a touch screen monitor, it's just as easy to use with a mouse.TouchJams offers an intuitive interface which allows you to quickly navigate to the songs that you wish to play.TouchJams keeps your music playing with robust queue support and a customizable Auto DJ feature. ...... Auto DJ feature. Need a switch from your own music collection? TouchJams offers Internet radio support with built-in radio station presets. Entertain your guests with a jukebox which everyone can easily and immediately use. TouchJams offers a Party Mode which locks out potentially harmful functionality. With TouchJams running at a bar or club, employees or customers can easily play requested music. TouchJams offers robust queue customizations so that song order can be adjusted, along with limiting the number of times a song can be played per amount of time. TouchJams is ideal for use in restaurants. With playlist support and a customizable Auto DJ feature, TouchJams can play the type of music you want for your establishment. Qweas is providing links to TouchJams 2.7 as a courtesy, and makes no representations regarding TouchJams or any other applications or any information related thereto. Any questions, complaints or claims regarding this application TouchJams 2.7 must be directed to the appropriate software vendor. You may click the publisher link of TouchJams on the top of this page to get more details about the vendor.